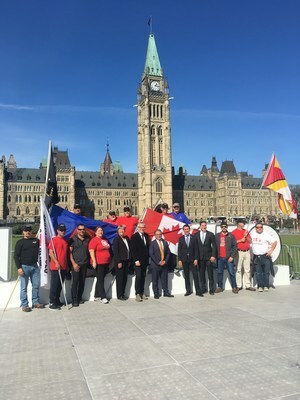 OTTAWA, Oct. 2, 2017 /CNW/ - Over the past 11 days, volunteers and supporters of Renos for Heroes have marched 300 kilometres from Canadian Forces Base Trenton to Parliament Hill to increase awareness and raise money for Canada's wounded veterans. Included in this group of supporters were Carpenters' Union representatives. Veterans Affairs Minister Seamus O'Regan and other government officials were also in attendance. Founded in 2010 by HGTV host Jim Caruk, Renos for Heroes enhances accessibility through home renovations to improve the lives of wounded veterans and their families. "Canada's veterans have done so much for our country. Renos for Heroes is about showing our appreciation for their service by ensuring that when they come home, moving around the house doesn't have to be another battle," said Durval Terciera, lead organizer for the 2017 walkathon and Carpenters' Union representative. "This is the fourth year that I've made the walk. I'll keep going for years to come if I can help make the lives of our wounded warriors easier." More than 100 Canadian military personnel have lost limbs since the Afghan mission began in 2002 and hundreds more have been seriously wounded. Many of them return home and face significant difficulty, especially with their decreased mobility. The Carpenters' District Council of Ontario is a proud supporter of Renos for Heroes. Its union members have dedicated their materials, skills and labour to help transform the homes of more than a dozen wounded veterans. "Coming home, Renos for Heroes was there for me from the very beginning," said Mike Trauner, Medal of Military Valour recipient and Invictus Games' gold medalist. "The home renovations they provided gave me back my freedom and independence and their funding for athletic training equipment was instrumental in my achievements at the Invictus Games. I can't thank Renos for Heroes enough for being there with me throughout my journey." The Renos for Heroes 2017 walkathon has raised more than $100,000 dollars to support wounded veterans. Donations to support Renos for Heroes on its mission can be sent to Renos for Heroes, 196 Evans Avenue, Toronto, Ontario M8Z 1J7 with reference to the 2017 walk on the memo line of the cheque. You can also contact Renos for Heroes donation department directly at 866-964-7187 or info@renosforheroes.org. 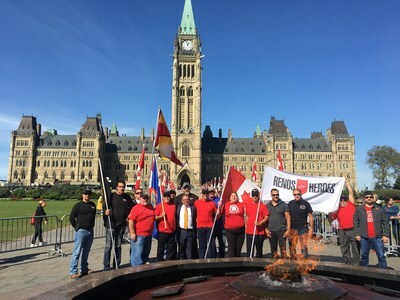 Founded in 2010, Renos for Heroes is a non-profit foundation which provides building services to improve lives of wounded Canadian soldiers and their families. Whether a soldier's injuries are physical or a result of post-traumatic stress disorder (PTSD), Renos for Heroes is committed to making changes to their homes, minimizing the expense and reducing the stress. The Carpenters' District Council of Ontario is comprised of 16 affiliated Local Unions of the United Brotherhood of Carpenters and Joiners across the province. In total, we represent over 26,000 women and men working in a wide range of areas, including carpentry, drywall, resilient flooring, concrete formwork, underwater construction, welding, scaffolding, and a long list of other construction-related work. The CDC conducts centralized collective bargaining in the construction sector on behalf of our affiliated Locals. The resultant provincial collective agreements are the foundation of one of the world's most productive and efficient labour-management systems.